Announcing the 2018 Kona Roster! Spring is just around the corner, and that can only mean one thing: bike season is near! We’re excited to kick things off by announcing our 2018 roster, which is chock full of speed, talent, and creativity, ensuring an exciting and memorable season. Graham Agassiz. Whoever said, “freeride is dead,” clearly never rubbed elbows with Aggy and friends. Aggy’s goals for 2018 are to continue to push the limits of what’s possible on a bike, ride as many wild lines as possible, and create some interesting content. Josh Button of Australia, and Anthony Poulson from Quebec. 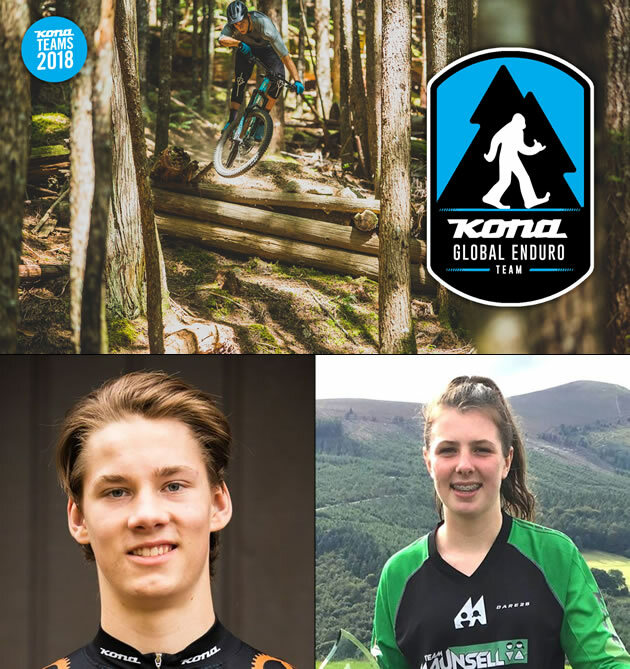 New for 2018 is the Kona Global Enduro Team. 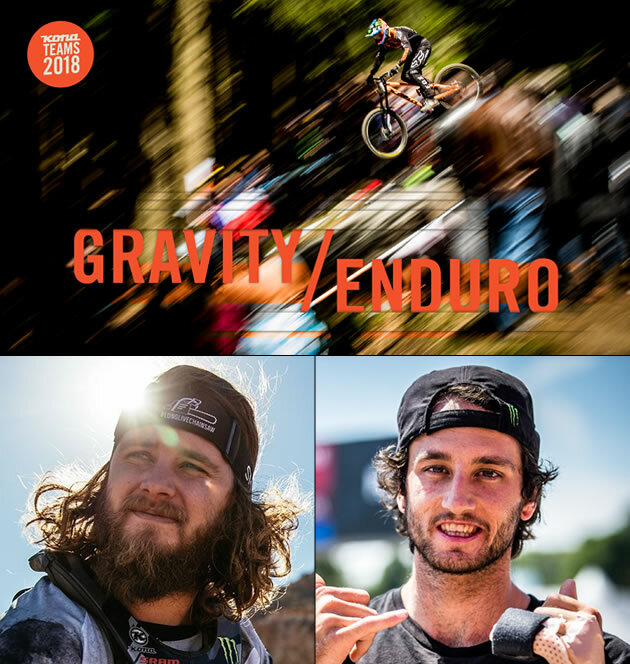 The Global Enduro Team will compete in races throughout the world, including the EWS. Squamish ripper Rhys Verner, who saw strong results in 2017 will be leading the EWS charge alongside Ireland’s multi-national champion Leah Maunsell. Verner and Maunsell are joined by Swede Alexander Kangas and Americans Ryan Gardner and Scott Countryman. Keeping the spirit of fun alive is the major goal of Kona’s Endurance and Adventure Team. Personality and talent run deep with this crew, and a good time is never far away. With 24 Hour Solo World Champion Cory Wallace in the mix, big races, and bigger challenges are sure to unfold. Finishing in 3rd place at US cyclocross nationals, Kerry Werner is back and ready to challenge for the top step of the podium. Americans Barry Wicks and Spencer Paxson are always up for whatever shenanigans they can concoct on their bikes and will be joined on big adventure days by Sechelt’s Kris Sneddon. The 2018 Kona team covers a massive spectrum of riding talent and abilities and we’re looking forward to seeing what’s in store! 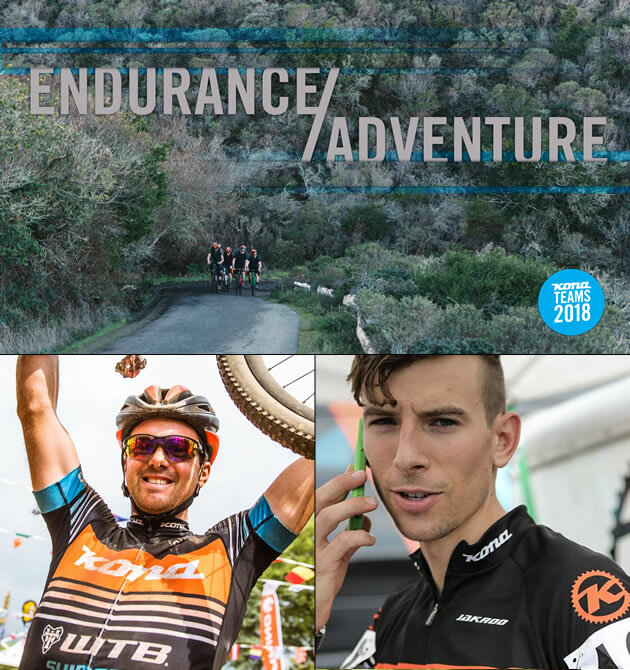 Be sure to check out our team page on Konaworld.com for more info on each rider, and tune into the Cog throughout the season for updates on race results, expeditions, and adventure logs. Pinkbike has a sweet little video in their Movies for your Monday section featuring rider Gaetan Ravoux getting mega stylish aboard his Kona Operator. This has us dreaming of big days on the big bike! It is one of the most dramatic competitions in all of sports. Over 30 athletes from around the world converging on a venue that, upon first glance, looks totally un-conducive to mountain biking. Armed with their dig crews, and a week of shoveling, watering and picking in lines that defy both gravity and reasonable thinking, riders then mentally prepare to drop in on what can only be described as insane. Kona has history at Rampage. Our best result ever came at the bravado of Antoine Bizet in 2012 when he placed 2nd. Graham Agassiz has threatened to crack the podium numerous times having won qualifications in 2013 and 2014, but hasn’t been able to put it all together when it counted in the finals. In 2013 he came within a slipped grip of winning it all. For riders it’s an incredibly challenging mental and physical endeavor. The amount of time they actually ride is quite minimal. Most of their week in the Utah desert is spent digging and sculpting, choking back the nerves that come with creating lines you’re not sure you can actually ride. But the risk to reward ratio outweighs the jitters. If you want to be a professional big mountain rider, you have no choice but to buck up and ride Rampage. The numbers dictate as much, this year’s viewership broke all previous Rampage records with rumors that this was actually the second most viewed event in Red Bull broadcast history. But not all is right as rain for one of mountain biking’s more seminal events. For years the riders have complained about the lack of ownership of the imagery that comes out of the event, not to mention the relative shortfall when it comes to prize money. Know that none of the athletes are paid an appearance fee, and with a total prize purse of $100,000, amongst the 30 or so athletes that participate in the event, there’s not too much love going around. While the organization, medical response teams, and broadcast production systems are world class, the value that comes to the riders is measured only exposure. Significant to be sure, however, from a bike company’s perspective, not to mention the athlete’s, it’s a nerve racking, risky endeavour. Exposure isn’t necessarily guaranteed while the potential for injury is massive. The builders behind the riders. Aggy with his legendary Kamloops crew. Bizet with his brother Ben, part of his French crew. And while there’s always been a history of injury at Rampage, this year proved to be the most consequential in its 10 event history. Miraculously there hasn’t been a life altering injury (or for that matter, death) at the event. Sure, there’s been a slew of broken femurs and deep gashes, and a myriad of close-calls, with a couple of life-flight medivacs every year, but there has yet to be an injury that had the potential to dramatically change someone’s life. Until this year. Unfortunately, long-time Kona and Red Bull athlete (he currently rides for Scott), suffered a broken back when he couldn’t regain control of his bike after a giant air. Paul Basagoitia, who rode for Kona for almost a decade and is a much respected and followed athlete in the sport, shattered his T12 vertebrae and is currently on a long road back to recovery. For those watching the Rampage both live and on their computers, shortly after his dramatic medi-vac, Red Bull reported that Paul was fine and only needed to have a leg injury checked out the hospital. This has obviously infuriated many and as a result Red Bull has some answering to do. Regardless, a good man is down. And it’s no one’s fault necessarily, just a sign of how elevated the stakes have become at this event. If you’re interested in participating in Paul’s recovery, you can do so here. After Paul was evacuated, standing at the top of the mountain was Graham Agassiz, who qualified 1st the day previous, his third consecutive Rampage qualification win. As the wind started to pick up, Aggy had to watch as his friend and former teammate was airlifted from the venue. You can only imagine the stress. Not only had Aggy encountered terrible luck in the years previous when it came to the finals, he had to mentally let go of the fact that his friend was obviously hurt real bad. Not to mention, earlier in the day his teammate and second place qualifier, Antoine Bizet, was carted off to the hospital earlier in the finals, suffering a broken humerus after attempting a double back flip on the bottom of the course. “If he had landed that double he would have won for sure,” said Aggy after the event. “The kid is such a badass, he was inches away from one of the best runs in Rampage history.” To watch Antoine’s incredible 2nd place qualifications run, which included a backflip over the 70-foot canyon gap, go here. Antoine’s double backflip induced broken humerus. He recently had surgery and will make a full recover. When it’s all said and done, we here at Kona can’t deny the power of this event. Of course we celebrate the successes of our athletes. Qualifying 1st and 2nd was huge for Kona. Aggy hitting the podium in 3rd and Antoine coming so close to glory–despite a fairly serious injury–shows just how talented and committed our athletes are. Would they be tested, and ultimately showcased, at this level without the Red Bull Rampage? Perhaps not. Questions remain for the future of the event, however, which is under heavy scrutiny right now. By closing out the athletes when it comes to prize money and ownership of media, as well as the companies behind the athletes–their was virtually no mention of athlete sponsors during both the live broadcast and on-site–Red Bull risks alienating the people who ultimately make the event happen, that being the Antoine’s, Aggy’s and Basagoitia’s of the world. Them and the company’s that stand behind them through all the glory, failure, injury and exaltation that comes with being a professional mountain biker. Portland, Oregon is known for two things. It’s one of the most cycling friendly cities in the US and it has the largest amount of adult dance clubs per capita in North America. Everyone on the RV could relate to both. When it came to the cycling side of the equation, the one day we spent in Portland was dominated by super urban shredder, Wayne Goss. The kid from Smithers, BC sure can ride the street. The fine fellas at Freeride Entertainment have just released the teaser to their newest film: New World Disorder 10 – Dust & Bones. Great storytelling, insane action, and very nasty bails. Check it out.